Taking the ferry to France is a good way to be able to visit another country within the confines of your own car. Flying does not suit everyone and with small children or large luggage and sports equipment, all required on a family holiday, travelling by ferry is a godsend. You can load everything into the back of the vehicle and add a roof box if required. Children can be kept occupied with their own toys and games. Of course those lucky enough to have the latest gadgets, can watch films on their in-car entertainment system, allowing the parents to get on with the serious stuff of driving. The most popular port to travel to the continent by ferry is Dover. Dover has been the most famous of our port towns for hundreds of years and its white cliffs have been immortalised in song for a very good reason. The white cliffs are really beautiful to look at, they may be crumbling into the sea but they nonetheless have a very important significance to the UK and travelling by ferry from the port of Dover gives you the chance to see them in all their glory as the ferry to France slowly winds its way across the channel. Catching a ferry is a little more relaxed than catching a flight. Security is not a tight as it is at an airport and there is not the endless waiting around. Ferries in general, leave and arrive on time. The ferry terminal at Dover has a number of facilities to keep passengers fed and watered before they sail, along with a few shops. The Port of Dover is the nearest port to France with a distance of 21 miles. The total sailing time is one hour and 30 minutes and takes place every hour. 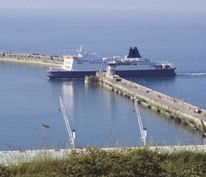 DFDS Seaways and P&O Ferries provide sailings between Dover, Calais and Dunkirk 24 hours a day. SeaFrance used to offer daily sailings until it went into administration early in 2012. Another popular route is Dover to Dunkirk. Dunkirk is only 6 miles away from the border of Belgium and is a less busy port, it is France’s third largest port and the crossing takes roughly 2 hours with 12 sailings a day. The beaches at Dunkirk played a very important part in WWII history, when 300,000 troops were rescued by an armada of boats and ships drawing many tourists to visit Dunkirk today. The city of Le Havre has its port to thank for its economic growth through the ages. It is the biggest deep water ocean port in France and although it is not an ideal holiday destination, it does have some fantastic buildings, some good beach side restaurants and a few really interesting museums such as the Musee des Beaux-Arts Malraux which has a vast collection of art from the past five centuries. Le Havre is an ideal destination when travelling to the Normandy area of France. The crossing from Portsmouth takes from 5 hours 30 minutes. If you are considering travelling to Brittany and beyond then Brittany Ferries offer luxury ferry cruises to Caen Cherbourg and St Malo from Portsmouth, Poole and Plymouth . Choose from a fast craft sailing or a leisurely overnight crossing arriving in France refreshed for the journey ahead. St Malo is one of the busiest ports in France as it also welcomes large cruise liners as well as ferries and is home to the largest amount of seafood restaurants in Europe. One place that can help you find the best deals when taking a ferry to France is Ferryonline who can compare different operators in one search saving you time and money as they pull the lowest web fares available in their results.